Piccolo – Oh, what do you know? I took a trip down to Piccolo. Piccolo is the Italian restaurant on Middle Street that took the place of another Italian restaurant previously located there. I’d heard a lot about it, but it’s fanfare was much greater than it’s physical size, as the place balances on the line between tiny and very small. When the idea to go popped into my head just hours before my wife randomly told me she made a reservation there, I knew it was fate and that I must try it. We were seated at the bar and given our choice of four seats from which to choose. We kindly sat at two that left the other two empty seats adjacent to each other. It was the only civilized way to handle such a decision. We got our menus and were offered some sparkling or still water. Though Peterpeterportlandeater does occasionally speak in the third person, he does not drink sparkling water, so he and his wife ordered some of the still. The first thing I noticed about the menus was that the food menu was quite small. At only a dozen total options, it was that smallest I’d seen in recent memory. The beer and wine selection was larger, so I knew that Piccolo had their priorities straight. I started with a glimpse of the drinks, picking out a beer I’d never had. When the waitress came over, I actually asked for a Shiraz or Syrah in lieu of my preselected beer, but they didn’t have one. Instead, the waitress insisted that I try another one she picked for me. I did and it was pretty good, so I ordered it, though I had to convince the her that I really was okay with it and not just caving in to make her happy. My wife ordered a white so as not to stray from her regular selection. After we received our beverages, we were given a couple specials to consider and we continued to peruse the food menu. We looked at the snacks and apps on the menu and considered the specials which were both apps. We eventually decided to share the special Tomato Salad and the Formaggio – artisinal unpasteurized Italian cheese, semolina raisin toast, mostarda. For the entree there were only four choices, so it seemed to me like my decision should have been simple, but it was a little bit mind-tangling. I steered away from the meals with beef and lamb which left me with a couple seafood options – one with pasta and one without. 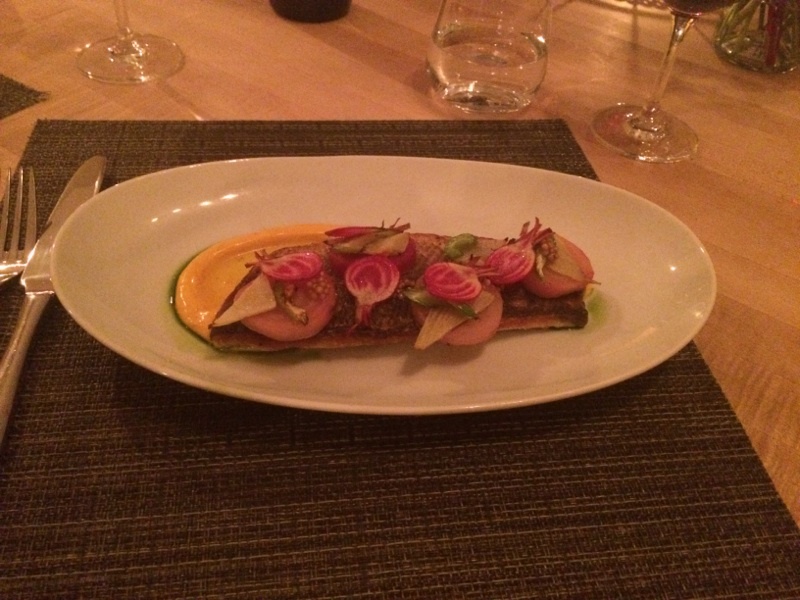 In the end, I decided upon the Del Mar – roasted sea bass, chioggia beets, local fennel, Ian’s celery. My wife fancied herself some of the Spaghetti Con Granchi E Ricci Di Mare – chestnut pasta, sea urchin cream, fennel, rock crab, nardellos. We put in our orders for starters first and then the mains shortly after. As we sipped our wines, we contemplated contemporary cuisine and culinary consciousness. On or about the time we got to the free-range chicken and not-as-free-range biscuits part of the discussion, our apps came out along with some bread and seasoned oil. The Tomato Salad appeared very fresh with different types of tomatoes and a little celery and radish along with some form of vinaigrette. The cheese board came with four cheeses, the bread, and a mostarda of the eggplant variety. We indulged in both appetizers, rotating between the fresh veggies and the excellent cheeses. Before long, all that was left was a lonely stick of gorgonzola – the sly, moldy fella lay on it’s side with two small bites taken out of it. Try as they might, these Portland restaurants won’t get me or my wife to finish the poor blue. Blue cheese blues aside, we were prepared to see what we had to come. It was a wait, but only a short one before a bowl and plate of potential palate pleasers made their way in our direction. My food looked lovely. A substantial sea bass rested with four stacks of beet, fennel, and celery on top. My wife’s bowl contained the long pasta worms topped with nardellos/sweet peppers, and the rest mixed in. Beginner bites were taken. I haven’t had a lot of sea bass, but this one was excellent compared to what I remembered about the fish of deep oceanic sound. I was even more pleased when I took a bite along with the veggie stack and the sauce smeared on the plate. I generally am not a fan of fennel, but it was hardly there and the combination of it all was really good. It was better than I expected for sure – unique and really tasty. My wife seemed to really enjoy hers too, so I tried it. The fresh pasta was delicious with perfect pasta texture and the sweet peps were very sweet, adding a nice spin to the dish. It all blended well, but the sea urchin cream was the kicker. The creamy consistency and the sea urchin flavor gave it a feeling reminiscent of ocean alfredo. It wasn’t more than moderately fishy though and both my wife and I felt it added to the meal. I see how it could be too strong or how some people might not be able to tolerate it at all, but we loved it. Our total came to 132 GW’s after tip – not inexpensive, but reasonable. I really enjoyed Piccolo. Their small but unique menu gave us a different take on Italian. Their cozy restaurant is a little tight, but definitely well placed. Their service staff was prompt, courteous, and knowledgeable. Add this one to your list when you’re looking for something a little out of the ordinary, when you feel like every day is exactly the same, and you want to branch out and feel alive in the superunknown. This entry was posted in Portland, ME food on August 27, 2015 by peterpeterportlandeater. The new Union restaurant at the new Press Hotel on Exchange St. is just one of the endless restaurants I had on my list to try. This past weekend I got that opportunity. We had early reservations because we’re old and tired and got there just in time. I was immediately struck by the layout and decor. It’s not that any one particular facet of the room stood out, I was simply impressed by the entire place as a whole. The great bar looked into the kitchen and struck me as a location I’d enjoy spending time at in the future. The seating areas to the right felt very welcoming. We were immediately seated and provided food and drink menus. I was happy to ignore the food for a minute while I gazed at the list of libations in an attempt to pluck one from the clutches of the Press Hotel’s sticky finger grasp. It didn’t take long before a drink called Because, Vodka caught my eye. With Tito’s, Pisco, St. Elder, pineapple, I was thinking that might be a cure for what ailed me. Wifey Wiferson went with the Dow Punch – Plantation Vodka, Aperol, pineapple, bitters, OJ, house grenadine. That sounded good to me too, but I stuck with my drink…well…because. After the drink orders were placed, I convinced the missus to share the Artisanal Cheese Plate – chef’s selection of three seasonal cheeses, local honey, black mission fig jam, toasted walnuts, sliced bread. She agreed and we put in that order before deciding on our entrees. The drinks came out at that time and mine looked like a lemonade while my wife’s had the aura of a Carribean cocktail. I tried mine right away, awaiting a cool fruit flavor. Much to my surprise, but not so much to my chagrin, my drink was stronger than a PED-ingesting ox. I surmised that it was designed by an expert alchemist after a really bad day at work. My wife’s potion was a little more subdued as I expected. Upon the arrival of our cheese plate, we placed our entree orders and got ready to cheese it up. There was one hard cheddar, a softer cheese, and a blue. I’m not a fan of blue cheese, but I did try it to be a sport and then I worked on the rest of it. I took several combinations of the cheese, honey, jam, and walnuts, along with some apricots that were included and placed them on the bread so that no two bites were ever exactly the same. Aside from the blue, I was quite pleased with it all and so was my wife who in the past has experienced unfortunate periods of cheeselessness. She even had more than one taste of the blue stuff. My one minor critique of the plate was that it would be improved if the bread were toasted, but as an imperfect person living in an imperfect world, I understood that might be something that would be worked out in the future. With the cheese down the hatch, we received some seasoned focaccia bread with herbed olive oil. It was quite a tasty carbohydrate and before long, the food we were anxiously awaiting came to the table. 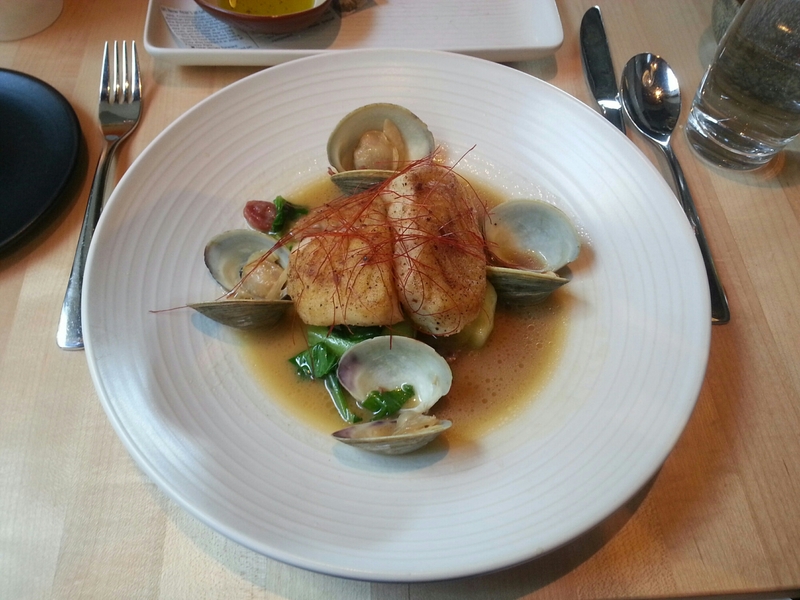 I had ordered the Roasted Casco Bay Cod – littleneck clams, soy brown butter, bok-choy, and Chinese fermented sausage. It was ordered with a bit of trepidation as cod is not my favorite white fish, but I liked the description of the meal and it did look good on the plate. My wife got the Grilled Salmon – lemongrass ginger tea, farmer’s market vegetables, cilantro. Our meals were ready to go so we went and dug into them. The cod was quite good with a bit of a crispy layer on top which I appreciated. Dragging it through the brown butter made it even better. The bok choy was very good and the littleneck clams did indeed have little necks, and they were delicious little necks. But the kicker to it all was the Chinese sausage. Tasting like candy, the sweet coins of pork were a stone cold stunner of an addition to the meal. They gave an already well-done cod the pizzazz of dueling piano players dressed as Liberace. My wife and I enjoyed our meals and finished them without difficulty. We soon requested a dessert menu because that’s the way the wind was blowing that evening. On the menu were cookies and candies, chocolate, custard, ice cream, and cheese, but, for no particular reason, after the cod, I had officially taken a stance against the letter “C” as a food-title starter. It posed a bit of difficulty for me until I looked at the top of the page where it featured the “Snickers” – chocolate cake, peanuts, nougat, ganache, salted caramel, ice cream. The snickers it was. I passed on another drink so I would be able to walk out of the restaurant on my own accord. Dessert was on it’s way to our table and I was salivating like Pavlov’s dog. A layered delight of nougat, choco cake, caramel, and peanuts sat to one side while some ice cream sat on the other side surrounded by some crumbs of what might have been more chocolate cake. Impaling them both was a wall of peanut-adorned crunchy. We spooned our first bites. It was quite sweet for me. While I tend to not like ice cream with my dessert unless the ice cream is the center of the dessert, the cold stuff helped on this one. It tempered what I thought was too much sweet and made it highly palatable as did the crunchy. As we did most of the night, we finished the entire dessert and made our way toward the finish line. After tax and tip, we spent 137 bucks. Compared to what we’ve been eating – see my past couple posts – this was a bargain, but it wasn’t cheap. Union serves up a real good meal and a stiff cocktail for probably a little more than other similar restaurants in Portland, but I sort of expected that from a hotel restaurant. The good news is that Union definitely keeps up with Portland’s very high standards of quality, dining atmosphere, and service. They use many local ingredients, have their own original take on the standard fare, and offer a really pleasing settings in which to get your hands on some food. You’ll go there. Yeah you will. This entry was posted in Portland, ME food on August 6, 2015 by peterpeterportlandeater.